Home security products exist because they do protect you - like a car's seat-belts do - IF you actually use them. Please do not naïvely think you enjoy "location immunity." Criminals know that people in "safe" neighborhoods brag about not locking their doors and windows (and then are so shocked after an intrusion). Unlocked doors and windows are my #1 pet peeve. They account for at least half of the 7,000+ home intrusions (burglaries and invasions) every day in the U.S. alone. Two gunmen kicked through the back door of the home of 68-year-old Bernie Meyerfeld and his wife, Effie. A week earlier, two gunmen kicked in the front door of 71-year-old Umberto Bifulco and his wife and shot him in the leg. Days before that, a gunman kicked in the front door of the Mooneyham house. All in sleepy Pittsgrove Township near Philadelphia. 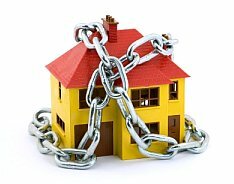 Home-builders care far more about keeping costs down rather than your security. 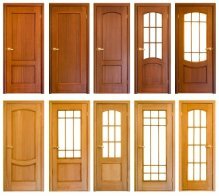 Common exterior doors take only a few seconds to either bash, kick, pick, lock bump, or pry through - all with ease. Is that all you have between you and a nightmare? Maxine Chandler heard a knock at the door of her Florida home and opened it (without checking first). A stranger grabbed at her. She broke free and slammed the door. Javaris Granger heard his mother screaming and loud crashes. He ran to the living room and saw a deranged man smashing a bicycle against the picture window. Then the madman began ramming the door. Javaris ran to his parents' bedroom, grabbed a gun, and ran back to the living room as the maniac kicked in the door and jumped into the living room. Javaris fired off a warning shot. The frenzied lunatic didn't leave until four shots later. 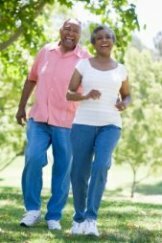 • Prevent a Walk-In by keeping your doors and windows locked at all times (doors and windows have locks for a good reason, you know). 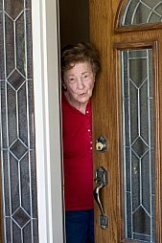 • Prevent a Push-In or Scam-In by always using a peephole and/or intercom before opening your door in response to a knock – and never opening it for anyone you don’t know well or for any clever scam. 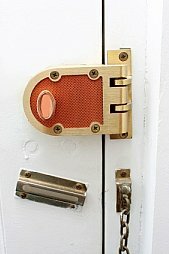 The National Locksmith laboratory (www.thenationallocksmith.com) tested a standard residential steel-clad door, frame, and rough frame against common burglar tools. Doorknobs were ripped off with a pipe wrench in an average of eight seconds. Common deadbolts were destroyed with only a couple of hammer hits. The very best security products were the Schlage B660P deadbolt, a MAG 747 High Security Box Strike Plate, and a Don-Jo reinforcer that fits around the deadbolt to stop the door from splitting. The deadbolt withstood a two-minute hammer beating, attacks with a screwdriver and hammer and a pry bar, and a series of running kicks by a massive martial artist. Nothing happened. 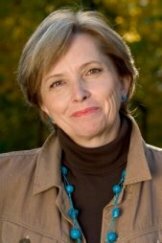 Next came a forklift, blades up against the door, applying gradual pressure until, at maximum speed, the spinning wheels burned through the floor tile and into the cement. Finally, the door crashed open. The strike plate had split because the doorframe cracked. In a home, drywall and wall-studs (especially a reinforced door-frame – see below) will likely make the entry even harder. For less than $100 per door, you can get these superior security products: a MAG 747 High Security Box Strike Plate, a Don-Jo Deadbolt Wrap-Around, and a Schlage B660P Deadbolt lock. Also reinforce your door-frames as described below. Even better than the Schlage B660P deadbolt are the B760 and (especially) the B860. Only they have Schlage’s Primus cylinder that is highly resistant to lock picking and lock bumping – even by an expert locksmith. The B860 also has drill and fire resistance. Find them at Lock Bumping. All your exterior doors should be fortified – especially secluded doors. Thinking it was a relative knocking at his back door, the Long Island NY homeowner opened it (without checking first). He was instantly knocked down by two gunmen and forced to crawl from room to room as they demanded cash and jewelry. Even though it was a Push-In, it could just as easily have been a Break-In. Criminals prefer doors that aren't visible to neighbors and passersby - including the door to an attached garage (so they can penetrate the door to your home while hidden by your garage). But they'll still often choose a front door - figuring they'll be in-and-out before police arrive. (The average police 911 response time nationwide is NINE minutes - an eternity in a crisis.) The point is: fortify ALL your doors. • Door – a standard residential steel-clad door has 24-guage steel with a wood lock-block core. Stronger steel-clad doors have cores of solid-wood (Calamine) or corrugated metal bracing, or 12-gauge steel cladding (12-gauge is thicker than 24-gauge). If you prefer a wood door, make sure it’s solid hardwood with no recessed panels (they're too thin and weak against a kick-in – but you can add decorative trim that looks like paneling). • Deadbolt lock (see above) – any locks less than a deadbolt are far too weak to qualify as true security products. I recommend only a grade rating of 1 (most hardware stores sell only grades 2 and 3). A decent deadbolt is made of hardened steel, has a five-pin tumbler, and a minimum 1-inch throw [that inserts into a hardened-steel strike-plate (see description above) secured by four 3-inch hardened-steel screws that insert into a reinforced door-frame]. Use a wrap-around (see description above) to reinforce the deadbolt/door interface. (To avoid splitting the wood, drill "pilot holes" before inserting screws.) See Lock Bumping for the very best deadbolt locks. See Door Security Systems for installing it yourself. • Reinforced door-frame – reinforced on both the lock and hinge sides – to withstand a battering ram or kicking in. Remove the (indoor) molding and insert wood shims in the gap between the door-frame and the (wall-frame) studs. Then drive 6-inch hardened steel screws through the door-frame and shims and into the studs to firmly connect the door-frame to the studs. Insert the screws roughly 8 inches apart from each other (4 inches nearer the strike-plate). Use 3-inch hardened steel screws on the hinges – with flat heads, of course. (To avoid splitting the wood, drill "pilot holes" before inserting any screw.) A few dozen screws are the least expensive security products. • Home Intercom System: a great addition to a peephole. 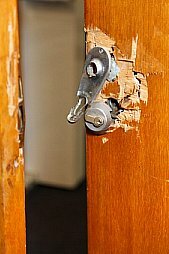 For even stronger doors (especially on a door leading to an unsecured basement or attached garage where a burglar can hide while attacking your door): use two deadbolts (on a solid hardwood door) – one shoulder high and another hip high, or have a locksmith install a vertical deadbolt (a.k.a. drop-bolt) or a Multi-Lock deadbolt that inserts into all four sides of the door-frame. As the Greenwood SC homeowner watched in horror, Kelvin Kenard Martin suddenly broke a window pane out of her front door, reached inside and let himself into the house with a pistol in his hand. The American National Standards Institute (ANSI) sets grades for door hardware, such as Grade 1 - highest, Grade 2 - intermediate, Grade 3 - basic. These days, with more and more intruders using "bump keys"--a key that can open almost any lock--or locksmith tools once intended only to resolve accidental lockouts, many manufacturers now offer bump-resistant cylinders. Standard doors are either 1-3/8 or 1-3/4 inches thick, with most hardware designed to adjust for either. Extension kits are available for thicker doors. Most hardware is interchangeable, only requiring that the backset (the distance from the edge of the door to the center of the knob or lock, usually 2-3/8 or 2-3/4 inches) matches the hole(s) in the door so that the latch or bolt throws properly. Some hardware sets adjust for both backset lengths. Levers come in both left- and right-handed models. To determine the appropriate handing, look at the door’s hinges from outside the door. If the hinges are on the left, you’ll need a left-handed lever. If the hinges are on the right, you need a right-handed lever. All these doors have either easily-breakable windows or weak, easily kicked-in, recessed panels near the door-lock. They look good - especially to a burglar. If you have a window in – or near – your door, it should be 96 square inches maximum, and located further away from your deadbolt lock than a tall man’s arm can reach (36 inches). Or use shatterproof glass (with a fortified frame). See Window Reinforcement. But if you're less concerned with security and insist on the stylish decor of recessed panels and breakable windows, then definitely get an alarm system or DIY home security system. • A Barricade Bolt is a bar placed horizontally across a door that engages strikes on both sides of the door-frame. Brackets (or strikes) attach to the door-jamb with screws. However, since the screws are parallel to the ramming force, they rely only on their skimpy threads gripping the wood - and the wood can tear away when rammed forcefully and repeatedly. The following door-brace is better. • Door-brace: (a.k.a. 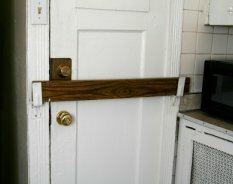 police brace or buttress lock) leans diagonally from the floor to the door to prevent the door from opening - IF you make sure both ends are firmly engaged against sturdy surfaces (or engage in mortised cavities). • Mortise bolts: sliding bolts in a cavity hollowed out in the wood (they're also known as flush bolts). Use on all four edges of the door. The downside is that they rely on flimsy screws into the door-frame. • Doorstops (a wedge under the door) might not stop a Push-In or a kick-in. But when traveling (or in a school dormitory), a doorstop alarm will at least slow unwanted entry, alert you, and might deter an intruder. • DANGER: Both the lock and the door-chain shown here rely on flimsy screws into the door-frame – thus they will NOT withstand an aggressive kick-in or push-in (for the same reason as the Barricade Bolt above - and these screws are even smaller). 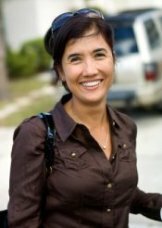 Instead, find the best deadbolt locks at Lock Bumping – and use a Peephole and a doorbell intercom (see Home Intercom System) – for knowing who's knocking without needless risk. • Double-doors ("French" doors) need a deadbolt lock and related hardware (see door security systems) and mortise bolts (see above) embedding one inch into the top and bottom centers of a reinforced door-frame (see above). Use an astragal shield over the lock (outside) to cover the gap between the doors (mounted with tamper-resistant round head carriage bolts). Fortify windows, add an alarm, and good outdoor security lighting, or cover with folding grills. 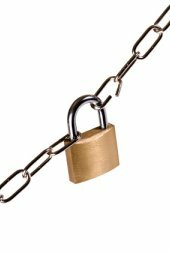 You can also supplement all that with a rubber-sheathed chain and padlock wrapped around the two indoor handles - or use a rubber-sheathed steel cable with a combination lock (such as a bicycle lock). • Dutch-doors (divided horizontally so that the lower or upper sections can open separately) need deadbolt locks and related hardware (see door security systems) on both sections – along with all the security products described above for exterior doors. See Sliding Door Security Hardware. • Padlock – get a minimum 3/8-inch stainless steel double-locking (heel and toe) shackle, and a brass keyway with a five-pin tumbler. File off key code numbers on the back (so that a criminal can't easily get a master key to fit it). No padlock is any better than the hasp or chain it secures. Hasps must be hardened steel attached with tamper-resistant round head carriage bolts. Chains must be welded-link, hardened steel – the thicker the better. Or get a thick locking-cable. • Hinges must be hardened steel and preferably mounted with longer, 4-inch steel screws. If mounted outside, attach with tamper-resistant round head carriage bolts.